Elizabeth and I were recently contacted by Jessica Kingsley publishers, asking us to review a new book. 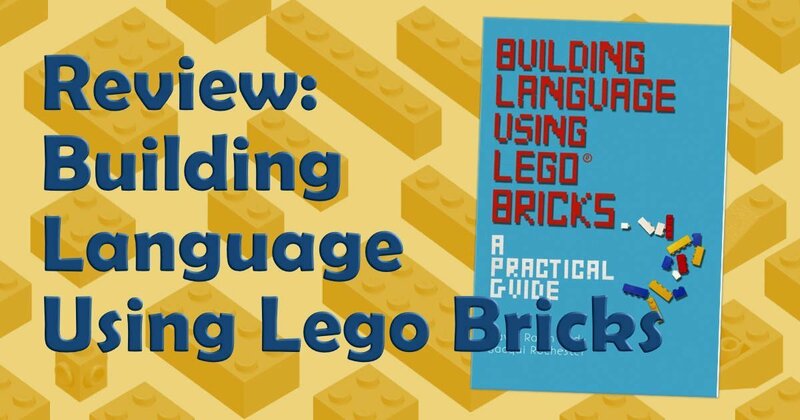 When I saw that the subject of the book was Lego and language skills, I was excited to see it, as I love using Lego in therapy – see our post about it here. I was sent a free copy of this book. However, the opinions in this review are my own. Lego therapy has been around as a specific intervention for several years now. It is a structured approach, used with children on the autistic spectrum, to help predominantly with social skills. For more information about traditional Lego therapy, look at this website and this video. Dawn Ralph and Jacqui Rochester, the authors of this book, have taken the original idea and expanded it. Building Language Using Lego Bricks can be used with children with a wider range of difficulties and diagnoses. They have also included a greater focus on language skills – developing comprehension, working on concept understanding, sequencing, description skills etc. The basic idea is that children work in pairs. One is the engineer who has the instructions and relays these to the other child. The second child is the builder who has to listen and follow the instructions. Traditional Lego therapy includes a third role of supplier. Using just two roles makes it easier to implement as a speech and language therapist or a parent, where you do not necessarily have access to as many children as in a school. The book includes lots of information about the sorts of difficulties that Building Language Using Lego Bricks can help with, and why it helps. There is information about how to pair children, setting specific SMART targets, assessing skills before and after therapy, as well as some guidance on how to run the sessions. Some case studies are included. There are also lots of forms and checklists at the back ready to use and also some visuals for some of the concepts, as well as prompt cards to help children use repair strategies when communication breaks down. The visuals are all available to download in colour from the Jessica Kingsley website here (scroll to the bottom of the page where it says Resources). The preface to the book states that it is aimed at both parents and professionals. I would say it would be most useful for schools as all the forms and checklists and detailed information on target setting would be really useful in a school environment. However, as a parent you could also use it. The practical information about how to run sessions is towards the end of the book, and you may want to pick and choose a little more, which bits you read of the beginning sections, depending on the needs of your child. It explains how to carry out a session very simply and easily. It goes through in lots of detail all the different skills that you can work on, with assessments, forms and checklists. The approach is simple and can be used with a wide range of children – there is a chapter on how to pair children most effectively as well. It is a very flexible and adaptable approach, making it useful for a wide range of children. Jessica Kingsley publishers have kindly offered a discount code to Special Needs Jungle and Speech Blog UK readers. If you want to buy the book with 10% off, add the code LEG at checkout on the Jessica Kingsley website. Helen is a speech and language therapist with more than 10 years' experience of working with children, families and schools.She is a regular columnist for Special Needs Jungle and also blogs jointly with Elizabeth Gunner at Speechbloguk. Helen is a speech and language therapist with more than 10 years' experience of working with children, families and schools. She is a regular columnist for Special Needs Jungle and also blogs jointly with Elizabeth Gunner at Speechbloguk. Looks interesting and might work well for my little visual learner.